We're very nearly at the end of a very tiresome refurb of our downstairs area. As you can see from the photos, our builder has used silicone wood filler where the floor meets the door-frame. His reasoning is that any hard (setting type) wood filler would crack as you go through a year with the changes in humidity as the floor moves. I think what he has done looks horrendous and I'm not happy with it. Does anyone have any suggestions as to what can make it look better? While re-doing the floor to go under the trim would be desirable, a hack might make things worse. My best suggestion is a square edge plinth block to cover the mess. Maybe you'll have to do that with a few adjacent doors to match up, but it's an extremely easy fix. The flooring is supposed to extend far enough under the door trim molding so that no sub-floor is visible. The gap you have is non-standard and is completely unacceptable. Presumably you have some scraps of flooring left. 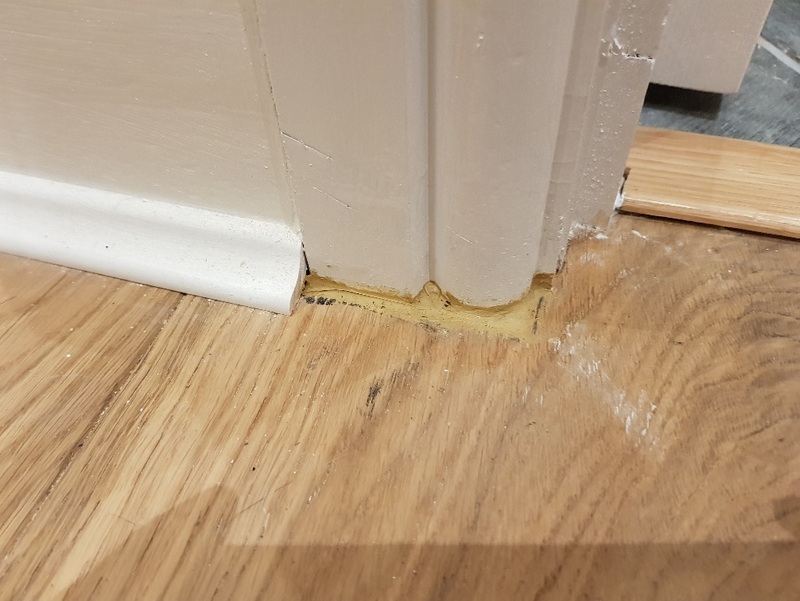 The installer should scrape out the filler and insert a piece of flooring into the gap. To be able to work in the scrap of flooring, the installer might have to cut off a small amount (say 1/8") of the door trim, but this would be inconspicuous. Using a chisel, cut back the door trim and add some trim over the gap (assumes you have extra). Bevel the outer edge to avoid a hard corner jutting out. You will have to do this on the other side as well, but it would cover the problem area. The wood filler stands out because of the color mismatch (i.e. you match the color you can, not the one you can't). Since this is up against the baseboard, you could cover this up with white caulk and, unless you looked hard at it, you'd be unlikely to notice. That is not properly done at all. The proper fix is to undo the trims and add floor where there should be floor. That may or may not be a huge fix, it is hard for me to know the size of the room or the distance from a place to start undoing the floor. As for hacks, I'd fix it by shortening the door frame trim and lengthening the floorboard trim (buy a decent length, just adding a 2-inch piece will not look pretty.) It would look much neater - and don't take this the wrong way - but judging from the state of the trim between floors, that trim on the door itself and the state of the floor - adequate compared to the rest. Which is the point, it needs to not stand out. Not the answer you're looking for? Browse other questions tagged flooring trim silicone wood-filler or ask your own question. How much weight can a floating floor tolerate? How deep can you sand into pine flooring?